Hole 1 on FHTC’s disc golf course. What started out as a simple solution to have more practice space for a disc golf tournament, has now turned into a partnership that benefits both Flint Hills Technical College students and the community. During the recent Glass Blown Open Tournament, Dynamic Discs installed a temporary course on FHTC’s property to accommodate the many disc golfers in for the tournament. FHTC president, Dean Hollenbeck, and Jeremy Rusco, owner of Dynamic Discs, then discussed the idea of how to create something more permanent. The result is a 9-hole course on Flint Hills Technical College’s main campus at 3301 W. 18thth Avenue. The FHTC course was designed by Eric McCabe, originally from Emporia and alumnus of Flint Hills Technical College’s Graphic Arts Technology program. McCabe is a successful professional disc golfer with close to 100 tournament wins including the 2010 PDGA World Championship, he is also a champion disc golf course designer. His interest in designing a course on the campus comes from knowing the location. As the only 9-hole course in Emporia, it allows a quick and enjoyable round of disc golf suitable for all skill levels. 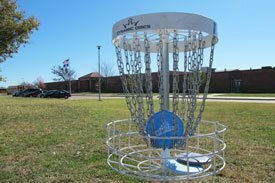 Dynamic Discs, founded in 2005 by Rusco, donated the baskets and course maps, and the project was installed by FHTC’s maintenance crew. Since its installation this summer, the course has seen many recreational players and also served as a practice course for the professionals that participated in the PDGA Professional Disc Golf World Championships. “Disc golf is the fastest growing sport in the United States because it’s for almost all ages, all abilities, and all walks of life. You don’t have to be a superstar athlete to get out on the course and have a great time,” Rusco said, explaining why disc golf has become so popular. There are currently over 5,000 courses in the United States, with that number expected to grow in the next several decades. So why a disc golf course at Flint Hills Tech? It enhances campus life as well as being a benefit to the area. For more information about Flint Hills Technical College, see www.fhtc.edu.